Since my article last week detailing why I think Esper Control is strongly positioned in Modern, I’ve been tweaking and tuning my list online. In the process I’ve learned a great deal about both the archetype and the current state of Modern. Today, we’ll be digging deeper into the archetype, discussing my current list, finer points, matchup plans, and some general thoughts on the metagame (for those that might not be interested in Esper Control). While I’m still in the process of tweaking my list, I’m pretty confident with where it’s at right now, as I’m currently 9-1 in my last two Modern League events. So stick around—today will be an exercise in archetype analysis, the tuning process, and metagame evaluation. As a quick recap, last week I began exploring Esper Control as an alternative to Grixis, having found the metagame a little too saturated with poor matchups for my liking. Death’s Shadow Jund, various midrange decks, Tron, Eldrazi, and Burn made up a majority of the enemies I was facing round to round, and all of those archetypes are either poor matchups or well-prepared for fighting a reactive opponent at this point. Grixis Control is a fine reactive strategy, but it often wins by inches, leveraging synergy and efficiency over general card quality. This is not necessarily bad—in a linear field the ability to maximize mana usage on every turn of the game often translates well to victory. In today’s field, however, I’ve found myself preferring higher-impact spells (e.g. Supreme Verdict) over synergistic interactions (Lightning Bolt–Snapcaster Mage–Lightning Bolt). The reasoning behind this is twofold: diverse threats leveraged against us discourage low-impact synergistic spells, and most archetypes are well positioned to fight our primary means of reaction. Think playing Tasigur, the Golden Fang or Lingering Souls to dodge Fatal Push and Lightning Bolt. One-for-one conditional removal, no matter how efficient, is increasingly becoming a liability in this format. Hence the desire to move towards sweepers. While we could stay on-color and play Damnation if we wanted, if we’re not excited to play Lightning Bolt, why stay in red? Dropping red for white might seem like a small move, but it fundamentally alters the composition of our deck and thus influences positioning in our matches. Access to Lightning Bolt and the Shock from Kolaghan’s Command can really add up with Snapcaster Mage, as anyone familiar with either side of the Grixis Control matchup can attest to. This characteristic is one of two driving forces behind why we see card choices like Tasigur, the Golden Fang and Creeping Tar Pit in those lists. Two or three hits from a single creature is often all it takes to get our opponent into burn range. The other reason, of course, is the card pool we’re given to work with. Lightning Bolt, Terminate, and Kolaghan’s Command are our red spells of choice because, simply, those are the best options in that color for us. This is not necessarily negative—there are fields where those spells are exactly what we want to be playing. 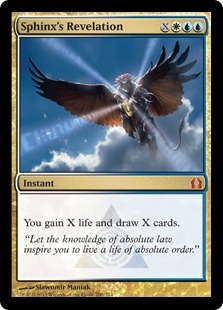 However, in this current field, Supreme Verdict, Esper Charm, Sphinx’s Revelation, Secure the Wastes, Path to Exile, and Celestial Colonnade are all enticing options to help us forget we ever missed red. Esper decks are “slower” than Grixis decks because they play slower spells, and they play slower spells because those spells are often better in the abstract. This sounds self-explanatory, but understanding this concept can really help us when we’re constructing our list and the inevitable “Geist of Saint Traft vs. Gideon Jura” or “Negate vs. Dispel” arguments pop up. Know your identity going in, and you’ll be able to make much better informed decisions throughout the process. That being said, let’s dive into a few points about my current list. The numbers might seem random, but they’re actually pretty tight if we understand spell choices as relatively interchangeable within categories. For example, with cantrips we want the full twelve: four each of Serum Visions, Think Twice, and Esper Charm. However, you can make an argument for cutting one Serum Visions and treating Sphinx’s Revelation for x = 2 as the twelfth cantrip. I could also see replacing a Visions for the fourth Snapcaster Mage, which can similarly function as a cantrip. In any case, Visions is definitely the cantrip I would cut if you wanted to trim. Think Twice is invaluable for pulling ahead. Remember that we’re playing 25 land and looking to play a land and a spell (at least) every turn. Before turn five our mana is stressed. Past turn five we’re fighting basic math. We’re either going to flood out or run out of spells—in both cases more cards are the answer. Continuing with numbers, it doesn’t matter much what mix of removal you play, as long as you’re playing eight or nine. I have eight (3 Path to Exile, 2 Fatal Push, 3 Supreme Verdict) to make room for the second Secure the Wastes. Having two copies of Secure means I can be liberal with the first one, firing it off the first chance I get. If you have the option between making two soldiers or flashing back Think Twice on turn three, take the creatures unless you’re digging for a specific answer like Logic Knot against Tron. Casting Secure for x = 1 isn’t going to get us anywhere in game one; our opponent more than likely is sitting on one dead removal spell and would love to get a full card’s value out of it. Postboard that play is fine, but only against an aggressive (non-Death’s Shadow) opponent. Assuming we’ve kept their board clear, we don’t have to worry about haste, so holding it as long as possible is the preferred play. Death’s Shadow Jund cannot beat Secure the Wastes (more on this later). Three Snapcaster Mage is the right number in my opinion. We’re playing 4 Cryptic Command and casting the first one as soon as possible. So Snapcaster Mage is at its best in our list when we’re casting it on turn three to flashback a removal spell or on turn six to rebuy a used Cryptic. Yes, there are definitely spots where we don’t have a turn-four Cryptic and can “build our own” using Snapcaster Mage and a spent Mana Leak (the 2/1 being the card we “draw”). Still, 4 Snapcaster Mage leads to us having two in hand more often, which we really don’t want alongside the playset of Cryptic Command. All the value in the world doesn’t help us if we can’t do anything meaningful until turn four. I see Snapcaster Mage as more of a late-game way to extend the value of our spent Cryptics, Revelations, and Secure the Wastes we’ve cast early to get us through the midgame, with the added value of what Snapcaster can provide on the early turns. If you insist on playing four, cut a Cryptic and try and squeeze in another one-mana spell (perhaps a Thoughtseize in the right field). Given the choice between flashing back Think Twice and casting Esper Charm on its draw-two mode, I’ve begun leaning towards casting Think Twice first. My reasoning before was a variation of “two cards is better than one,” basically thinking that more cards faster will lead to more information about sequencing and added value later on. For example, against an aggressive deck, two shots at a Supreme Verdict will inform whether I’m taking 3 damage or casting Fatal Push this turn, etc. However, the more games I’ve played, the more I realize just how invaluable Esper Charm’s Mind Rot mode is. I truly believe Esper Charm is the best card in the deck, and its ability to put the nail in the coffin of the opponent’s resources is a huge part of this. Sure, game one they may discard stranded removal spells, and there’s always a chance we trade the opportunity cost to draw two cards of our own for two of their extra lands in hand. In practice, this first Esper Charm just sets up for the second one to hit harder. A turn-five Snapcaster Mage on Mind Rot in their draw step will usually get whatever “big” spells they had left, and Time Walk them in the process. As with Wrath effects against aggro, they can usually weather the first one, but it’s the second that ends the game. And what if we never tag anything good with Charm? In the event they didn’t have anything relevant in hand, we were probably winning anyway. So in a certain sense, the worst-case scenario of Esper Charm‘s discard mode is still good for us! Maybe I’m a glass half-full kind of guy, but I’m struggling to see the drawback. If you need cards, just draw them. You can always Divination. To close things out, my last segment will focus on how our Esper list lines up against some of the top decks in the field. This isn’t a sideboard guide—and we do approach most matchups with the same overall plan—so instead I’ll focus on unique strengths and weaknesses present in the matchups and some tips for how to navigate lines. Up first, of course, is the de facto “best deck,” and one of our best matchups. Death’s Shadow Jund is the over-the-top control deck’s dream. Postboard they dilute their aggressive gameplan with all of these “anti-control cards,” when what we’re really scared of the most is pressure. Yes, sometimes Liliana of the Veil can win for them, but in reality I’d be more scared of facing a Monastery Swiftspear. This archetype’s primary weakness is their poor play options on turn one, hence their use of discard. While no control deck likes to see Thoughtseize, our list is redundant enough that it rarely matters. Take my Fatal Push? You’re not playing a creature on the first turn anyways, so I’m probably only getting hit once before I can just flash it back. Take my counterspell? You just traded your one-drop for my two-mana counter—I’ll take that exchange any day. Discard Esper Charm? There’s more where that came from, trust me. Yes, there are times where they grab the perfect thing and we whiff on answers, but those are few and far between. Beyond that, Rest in Peace and Secure the Wastes are both pretty close to lights out. Blanking Tarmogoyf, Traverse the Ulvenwald, Kolaghan’s Command, and Lingering Souls shuts down a significant portion of their threats with one card, leaving just Death’s Shadow and some Liliana ultimates to worry about. We lose some flashback of our own, but our losses pale in comparison to theirs. As for Secure the Wastes, the Temur Battle Rage/Ghor-Clan Rampager argument is a non-issue. They’re only playing two now, and we’re casting Secure on their end step. If we’re going into their combat step tapped out we’ve got bigger things to worry about. Making four 1/1s to chump-block 6/7s feels pretty dirty, and can buy us a ton of time. The Tron matchup is the same as it always has been, but I just want to use this section as an excuse to sing Esper Charm’s praises further. The back and forth tends to revolve around us countering as many of their things as possible and putting them into topdeck mode quickly, where we draw much better than them and can hopefully put the game away before they eventually reach Tron. Which will happen, by the way, as we can’t pressure them quickly enough to kill them before this happens. Hence why Esper Charm is so important. In most games, by the time they’ve assembled Tron (assuming we were able to interact with some significance) they are down to the last couple cards in hand. Soft-locking them by making them discard in their draw step is our primary path to victory, but only if we have some sort of pressure going on. Don’t be afraid to Ambush Viper a Snapcaster Mage or make two 1/1s quickly, as that’s how we’re winning this matchup. A wall of counterspells can help, but Worldbreaker, Ulamog, the Ceaseless Hunger, and Sanctum of Ugin can be difficult to fight. If classic Tron cracks the top five most represented decks I could see boarding a Surgical Extraction to take off their top end. The name of the game here is value, any way we can get it. They will try and overrun our removal with Thought-Knot Seer, Matter Reshaper, and Reality Smasher. Meanwhile, Cavern of Souls makes most of our counterspells irrelevant. Chalice of the Void is a problem too if they have it (though most Chalice decks are the Eldrazi Tron versions). Regardless, they have a lot of hard-hitting threats that can punish us if we stumble. Luckily, Timely Reinforcements, Secure the Wastes, and Lingering Souls are great at forcing them to commit into our Supreme Verdict. They tend to play one spell per turn, which lets us respond and use the rest of our mana to pull ahead on cards. Sphinx’s Revelation is our ticking time bomb that they can’t stop, but watch out for Stubborn Denial, Disdainful Stroke, or Negate. This matchup revolves around making sure we don’t take too much damage early so we don’t die to a Reality Smasher late. Oh, and they always have expensive things left over for us to grab with Esper Charm. Overall, I’ve been having a ton of fun with Esper Control lately. I’ve also been winning consistently, which rarely goes hand in hand with bringing control to the table in Modern. I’ll reiterate my point last week and say that if you’ve ever wanted to play classic Draw-Go in Modern, this is probably the best it’s ever been. Draw-Go is a fun exercise in some classic under-the-hood Magic fundamentals, and locking our opponent out from casting spells is just good clean fun as well. Good luck to you, and may all your Esper Charms hit double spells. Would torrential gearhulk be an option in this deck? While it is not as versatile as snapcaster mage, the big body is nice, and flashing back esper charm/cryptic command seems really strong. But is the body redundant, making it simply a less versatile snapcaster? I have no experience playing a deck like Esper Control, but I’d like to, and am just wondering if the gearhulk would be worth adding. Amen on now being the best time for Esper Control in modern. I started playing it 2 weeks ago and am having a blast. Trevor: do you like mana leak? I’m running 3 Logic Knot and 1 Negate instead. I just hate the idea of it being dead later in the game when I lean on counter magic to beat combo decks. scale.E: I thought a lot about Gearhulk but sided against it because it doesn’t work with Logic Knot. Instead I’ve opted for Clique as my SB card that can be used to increase your clock. I like having that ability against decks like Tron for the same reasons Trevor used in justifying the ambush viper use of snapcaster mage. I’ll also just mention that I’ve been running Runed Halo and have been a pretty big fan so far. It’s so useful in every matchup where removal is bad. I would be interested in a sideboard guide just for comparison. I think that is one of the most difficult part of the deck. I am most interested in how you board vs Abzan, Shadow and Eldrazi Tron. I used to play this deck a few years ago. Back then i felt that spell snare was very good because falling behind early is the biggest issue with the deck. I’m a bit out of touch with modern right now. Is spell snare not good anymore? Disappointing the author cannot be bothered to reply to the (few) comments on his articles.